“The month of March has many meanings. Spring is nearing, quarter one is closing, fashion season has ended, the Architectural Digest Design Show hits NYC and we extra love March because it’s Women’s History Month! At the heart of the luxury decor brand KOKET, fueled by founder and CEO Janet Morais, is a desire to empower and inspire women around the globe. We, of course, love men and wholeheartedly stand behind the belief that gender balance or #BalanceforBetter (the International Women’s Day 2019 theme) is the ultimate goal, but we are not there yet so the battle for equality reigns on.” – KOKET. Janet is consistently looking for ways to empower her team and beyond. As a woman who has worked her way to the top of the luxury design industry, Janet understands what it means first-hand to be doubted or disregarded based on gender. A powerful, confident and passionate leader, Janet is an avid-mentor to her employees, always looking to help them be the best versions of themselves. In 2018, Janet decided to take action and formalize her love of mentoring. So coupled with her desire to give back to the creative industry she established the KOKET-Love Happens Intern/Mentorship program (KKLh). A program designed to empower and inspire young minds. KOKET introduced the KKLh internship program on March. Open to men and women alike, the KKLh internship is unlike most traditional internship programs where fetching coffee and mailing packages are top priorities. Yes, on occasion interns help with such menial tasks. But at KOKET everyone takes on such responsibilities. From the top executives to part-time assistants the KOKET team is all-hands-on-deck all the time. KKLh was not built to create a team of administrative assistants. Instead, it is structured to inspire and educate young minds about the industry that Janet is so deeply passionate about. It is designed to give back to the design community and nurture the talent of tomorrow. During the program, the interns are tasked with a real-life creative challenge – to design a chair for the KOKET collection. The first class of KKLh interns designed an elegant curved chair which they fittingly named Bloom. After showcasing it at the London-based trade show Decorex in September 2018, the chair became an instant success. All profits from Bloom go directly to the internship program to help fund the next class, who in turn will be given a similar creative task. 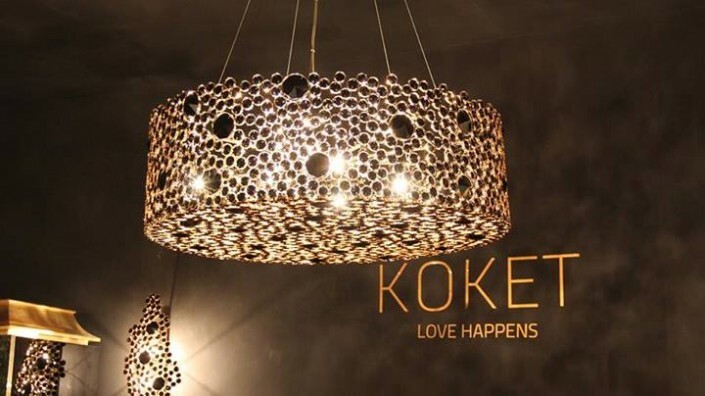 The KOKET-Love Happens Intern/Mentorship program provides interior design students and recent graduates with a one-of-a-kind, engaging, and multi-faceted experience in the interior design and furnishings industry. 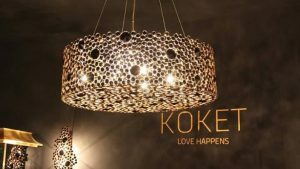 As a luxury product brand, interior design service provider, and magazine publisher, KOKET offers a dynamic learning environment in which aspiring designers are immersed in every element of the industry. Interns are mentored one-on-one by KOKET department heads while learning creative and technical skills through hands-on experiences in four key focus areas: Interior design/product design; Graphic design for the luxury industry, Editorial– Customer communication, magazine publishing, and blogs; and Luxury marketing and sales. Upon successful completion of the program, interns receive a formal letter of recommendation, applicable school credit, and exclusive access to future employment opportunities from KOKET’s network of luxury brand partners.